Banks got networked and money laundering went digital. This is as close to cause-and-effect as you can get. In the future, successful money launderers will demonstrate a closer affinity to tax cheats than bank robbers. Before something can be laundered well, it has to be collected and sorted – a truism for both laundry and money. Today's representative money is nothing more than a guarantee by the nation-issuer that the money may be used as legal tender in its jurisdiction - that is if you can find someone willing to accept it. No other guarantees are expressed or implied. Whatever value money may have is a function of the “full faith and credit” of that issuer. So when you launder it you can't wander too far away from the full faith and credit well. One step removed from representative money is modern fractional-reserve banking. FRB is a spinoff of the medieval money-lender tally system. Our global FRB is only possible because of modern computers and networks. Everything about it is digital. Modern money laundering (ML) uses this networked, digital financial ecosystem to transform illegally obtained money into legitimate money that is not under suspicion by law enforcement. The latest spin, reverse money laundering (RML), works much the same way but in the opposite direction: legitimate money is infused into a system in order to support criminal activity. RML achieved notoriety after the 9/11 attacks. RML achieved notoriety after the 9/11 attacks. As former US Department of Justice Deputy Chief for Money Laundering Stefan Casella pointed out, the existing ML statutes were too rear-looking and international to be effective in dealing with RML – they left significant statutory holes. ( http://works.bepress.com/cgi/viewcontent.cgi?article=1001&context=stefan_cassella ). These days, the ultimate success of digital money laundering revolves around access to one particular node: the U.S. financial system. Access to this node may include traditional money exchange via bank accounts, letters of credit, money service businesses (Western Union, check cashing services, etc. ), correspondent banking, legal trusts, and so forth. Orthogonal to the financial grid are formal and informal remittance systems, charities, Hawala networks, formal value-transfer systems such as Black Market Peso Exchanges, virtual or crypto currencies that use centralized exchanges (Bitcoin, Litecoin), consensus trusted ledger systems that rely on protocols (Ripple), so-called “Dutch Sandwiches,” and so forth. One may think of the entire ML enterprise as a map of trade routes of nuanced financial relationships. That's the how of money laundering. The why of money laundering usually has to do with the source of the money. Sales of illegal goods – as in drug and arms trafficking – are common sources, but so are proceeds from extortion, kidnapping, prostitution and human trafficking, fraud, corruption, counterfeiting , crimes of violence and, the largest single source of global ML – tax fraud. If the producing activity is illegal, the revenue is said to be in the darker part of the shadow economy. If the originating activity is legal but the revenue is unreported to tax authorities, it's said to be in a greyer part of the shadow economy. Money laundering in South Florida by the so-called “cocaine cowboys” in the 1980's defined what might be called the “golden era” of money laundering. Carloads of money were passed through counting rooms of participating banks as they skimmed their percentage before depositing it in the local branch of the Federal Reserve. In those days the teller windows were as porous as the Florida coastline, but those days are long gone due to aggressive regulatory enforcement. But they've been replaced by techniques far more insidious such as straw man and anonymous accounts in foreign banks located in uncooperative tax havens. While this has always been an option for the major criminal organizations, until recently it was considered a backup plan because it still required another hop to get into the US financial network. Tougher statutes and more rigorous enforcement have driven ML underground – completely into the digital world where it's harder to detect and involves no heavy lifting. The magic of successful ML has always been the avoidance of tracking. ML is like prestidigitation – think of Penn and Teller gone digital ( http://www.youtube.com/watch?v=oXGr76CfoCs ) . Money launderers usually begin with anonymous bank accounts (numbered, code-named, straw-man) and then follow up with “placement” of the dirty money into the financial networks via bearer shares, transfer companies, front or shell companies, charity accounts, proprietaries, correspondent bank accounts, Hawala networks, pass-through accounts, trusts, and so forth. The more successful money launderers introduce as many degrees of separation between the source and ultimate destination of money as possible (this is called “layering” in the trade). Usually at least one end of the money trail lies offshore in an uncooperative tax haven like Liechtenstein, Monaco, Andorra, the Cook Islands, Switzerland, Luxemburg, Panama, etc. (For a recent list, see the 2013 Congressional Research Service report, http://www.fas.org/sgp/crs/misc/R40623.pdf , p. 4). The corporate side of tax evasion adds techniques like earnings stripping, transfer pricing, cross crediting and the like. The use of the tax laws for tax evasion explained therein is critical to the understanding why tax evasion in general, and money laundering in particular, is largely unstoppable. A recent article in the Economist breaks out the tax havens by areas of specialization and client base ( http://www.economist.com/news/special-report/21571549-offshore-financial-centres-have-taken-battering-recently-they-have-shown-remarkable ). The profit potential in correspondent banking is so large that there is a giant economic incentive to circumvent any restrictive regulations as long as the government continues the current “too large to jail” philosophy with respect to facilitating banks and bankers. Former banking regulator William Black refers to this philosophy by the 4 Ds: degregulation, desupervision, and de facto decriminalization (William K. Black, The Best Way to Rob a Bank is to Own One: How Corporate Executives and Politicians Looted the S&L Industry, Univ. Texas Press, 2005). The facilitating bank is the primary crime scene in ML as we mentioned in the Credit Suisse and HSBC examples, above. The closure of shell banks, offshore banks, and shell corporations in non-cooperating tax havens just causes them to relocate or re-define themselves. This is the jurisdiction-shopping whack-a-mole side of money laundering. From the facilitating correspondent bank's perspective, due diligence involves determining sufficient information about “parentage, respectability and integrity” of a candidate bank to make an “innocent owner” defense plausible – it doesn't have to be true under current prosecutorial standards, just plausible. Once again, look where financial incentives lie. correspondent banking is “found money” as far as the facilitator bank is concerned – the revenues from services and fees for correspondent banking amounted to $590 billion in 2010 according to a recent SWIFT whitepaper ( http://www.swift.com/assets/swift_com/documents/about_swift/SWIFT_white_paper_correspondent_banking.pdf ) – that's serious money. Now just how much due diligence may we expect the financial industry to conduct when a $590 billion revenue stream is at stake? (The key issues of ML in correspondent banking were laid out in testimony before the Senate Committee on Government Affairs in 2001, http://www.gpo.gov/fdsys/pkg/CHRG-107shrg71166/pdf/CHRG-107shrg71166.pdf ). correspondent baking is the suds cycle in a money laundromat. 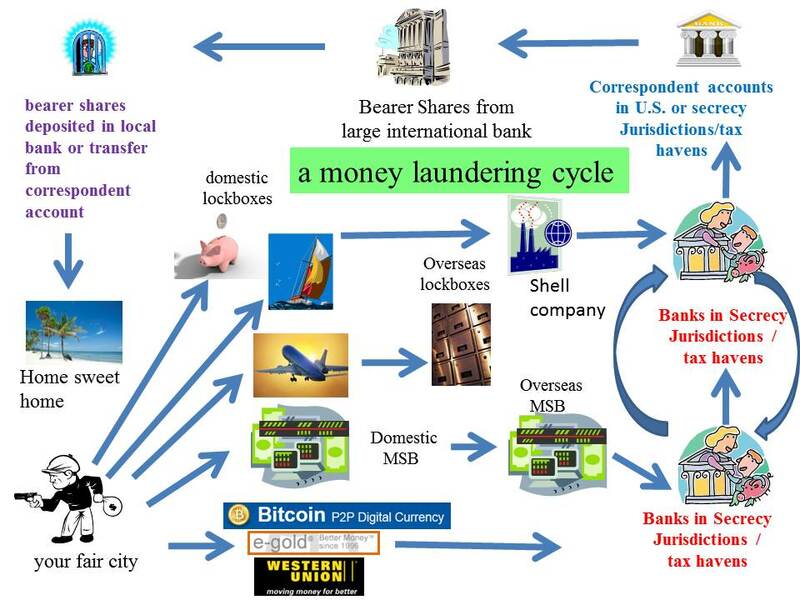 Figure 1: A typical money laundering cycle. This is not to deny that in rare circumstances banks may be closed for criminal activity. Castle Bank and Trust (Bahamas), Nugan Hand Bank (Australia), and Bank of Credit and Commerce International were all closed as a result of investigations into their involvement in money laundering, narcotics trafficking, illegal arms deals and sundry covert CIA operations (see Alfred McCoy, The Politics of Heroin: CIA Complicity in the Drug Trade, Lawrence Hill Books, Chicago, 1991). But such cases are fading into distant memory since the introduction of the Holder Doctrine.At this point the politically influential financial industry is largely self-sealing when it comes to criminal activity. Correspondent accounts, bearer shares, tax havens, and the like are individually and collectively criminogenic. The Justice Department's “faith-based” oversight is by design inadequate to the challenge. Therein lay the golden opportunities for future money launderers. So far, I've explained successful money laundering strategies from the perspective of tax fraud. At this point, the available evidence suggests that the worst case scenario for big banks with political influence that are caught laundering money is a modest fine. In the HSBC example, their $1.9 billion fine for laundering billions in narco-dollars in 2012 was approximately 10% of their profit for the year – not much of a disincentive when compared with the potential profits. A billion dollars here and there is just a cost of doing business. Before we drive our point home, we need to briefly discuss some failed tactics. Examples of digital criminal activity that hasn't panned out to any significant degree include online “Deep Web” Tor hidden services like Silk Road ( http://www.reuters.com/article/2013/10/02/us-crime-silkroad-raid-idUSBRE9910TR20131002 ) . At its zenith, Silk Road produced a few million dollars in monthly revenue – chump change when compared to the scales discussed above. Dread Pirate Roberts' mistake was in relying on security through obscurity. This tactic didn't keep Silk Road any more secure than proprietary code secured Internet Explorer. Dread Pirate Roberts did for the illegal online marketplace what Cliven Bundy did for the sovereign citizen movement. In effect both functioned as law enforcement intelligence honeypots. Another tactic that just won't stand the test of time in ML is the use of crypto currencies (Bitcoin, Peercoin, Litecoin). These are just not good vehicles for large scale ML because the security of crypto currencies is predicated on the computational complexity of the algorithms behind the proof-of-work systems. Some of us are old enough to remember that a similar argument was used to defend the 1975 Digital Encryption Standard! As with DES, crypto currency proponents fail to appreciate that when the stakes are high enough, the attack vectors are rarely limited to frontal assaults on algorithmic bastions. ML via prepaid products (aka gift cards) will also be in decline. When issued by global banks, open loop (use anywhere), cash access, online-compatible, prepaid cards are as useful as cash – and a lot better for trans-national currency movement because there was no evidence on the card itself. As law enforcement gains increasing statutory authority, the utility of these instruments will decline precipitously and the prepaid products will become relatively useless as serious money laundering instruments ( http://www.guardian.co.uk/world/2013/may/10/us-crime-debit-cards ). I should mention one potential ML vector that has been in the news recently: online gaming ( http://www.mcafee.com/sg/resources/white-papers/wp-jackpot-money-laundering-gambling.pdf ). There has been considerable publicity associated with Sheldon Adelson's full court press to create a federal ban of online gaming through his Coalition to Stop Internet Gambling resulting from a 2011 justice department ruling that states could regulate online gaming themselves under the 1961 Wire Act ( http://www.nytimes.com/2011/12/25/us/online-gaming-loses-obstacle-at-justice-department.html?pagewanted=all ). While online gaming does expose the player to fraud through collusion attacks and carries some attendant privacy risks, ML through online gaming is really only practical at the micro level. Convenience gambling is both easier and leaves less evidence behind. Deep web merchandizing, cryptocurrency, prepaid cards, online gaming, and of course the old standby credit card fraud ( http://www.theguardian.com/world/2013/may/10/us-crime-debit-cards ) are the later digital entries in money laundering. However, let's not overlook non-digital legacy tactics that involve converting dirty cash to physical assets like fine art, antiques, precious metals, rare coins and stamps, etc. -- this can even include race horses ( http://www.cnn.com/2012/06/12/justice/texas-cartel-horseracing/index.html ). Though still used, this kind of “integration” harkens back to the days of Al Capone and Willie Sutton. Attempts to convert fractional money reserves into physical possessions are invitations to discovery. That's why the smarter mobsters tended to live modestly. As I mentioned above, regulators and law enforcement has already pruned the low-hanging fruit. Future successes will have to emulate the corporate and individual tax cheats who operate with de facto immunity. It seems obvious to me that successful money launderers for the foreseeable future will focus their efforts on jurisdiction shopping for multiple legitimate banks in foreign tax havens with captive directors. There they can create nested correspondent accounts, daisy chained foreign shell companies, and blend in with the white collar crowd that have accounting backgrounds. correspondent accounts are absolutely essential to move capital around the world. That’s the primary vehicle businesses have for money transfers and account settlement, especially when large amounts of money are involved. Politicians who wish to remain in office will suggest regulation at their political peril. The remittance-transmitter industry is toast when it comes to future ML. Money service businesses are easy to regulate because they are not an integral part of the part of the financial industry. Using technology to shut off cash remittances comes with little attendant political cost as the principals have little lobbying influence with Congress. From a political point of view it is easier for the government to stop all money transfers over 50 cents than it is to prosecute a bankster or billionaire tax cheat who holds multi-million dollar accounts in Lichtenstein. Government regulators are fixated on crimes that are outside the U.S. and external to the U.S. financial industry – specifically the money laundering associated with narco-trafficking, terrorism, etc. This produces no political blowback as no one will pity a foreign drug lord or terrorist organization. A perfect example of this may be found in Operation Casablanca where the U.S. Justice department indicted three Mexican banks and twenty six Mexican bankers for laundering money from illicit drug profits. Not one U.S. bank or banker was indicted – the investigation stopped at the border! Look at Figure 1 again and note that ML involves a cycle that usually passes through the U.S. financial network. The US Department of Treasury admits that it is usually impossible to determine beneficial ownership of a carefully structured trust, company, or partnership organized under foreign law. “ If a U.S. person can arrange to receive investment income through means that permit the U.S. person to appear to be a foreign person, the U.S. investor may be able to evade U.S. income tax entirely.” ( http://www.treasury.gov/tigta/iereports/2013reports/2013IER008fr.pdf , p. 23). According to this same Internal Revenue Service April, 2013 report, the 2006 Tax Gap (the difference between taxes owed and those actually paid ) was $450 billion (p.2). To put this in perspective, in 2012 the White House estimated that the total annual expenditure on illegal drugs in the U.S. from 2000-6 was $103 billion ( http://www.whitehouse.gov/sites/default/files/page/files/wausid_report_final_1.pdf ). That is, if the government took over the illegal drug business, its total revenue would be less than ¼ of the amount lost to tax fraud. From the bankers' perspective, under the reasonable assumption that all of the proceeds from narco-trafficking and tax fraud are laundered, the total illicit revenue to the banking industry is at least $550 billion per year, which translates into billions of dollars in vigorish for the handlers. It is pretty clear from the above that future success in ML will be proportional to the ability to emulate tax fraud. The tax gap is as permanent a benefit to the political donor class as tax shelters, tax credits, property tax abatements, private letter rulings, accelerated depreciation and deferred income. Its beneficiaries are rich, powerful, and after Citizens United increasingly empowered. Future money launderers have no choice but to stay close to their well. Major international banks like HSBC, JPMorgan Chase, Bank of America, etc. process trillions of dollars of funds transfers daily, almost all of which are automated and require no human oversight. It is important to understand that these transfers do not require credit, so due diligence will not be conducted for the sake of risk-aversion, but simply for the sake of compliance! But banks are incentivized to engage in AML compliance only to the extent that they avoid the modest fines. Their greatest potential exposures – to criminal prosecution and forfeiture of access to U.S. capital markets - is not at risk as long as governments continue to offer the banking industry perverse incentives. During the Warren Harding administration nearly a century ago, a corrupt Secretary of the Interior by the name of Albert Fall was found guilty of accepting bribes in exchange for favorable lease arrangements to the Teapot Dome Oil Field to, among others, Harry Sinclair of Sinclair Oil Co. While Fall was convicted, the well lawyered-up Harry Sinclair was found not guilty of fraud and bribery. This prompted Senator George Norris from Nebraska to remark: "He has too much money to be convicted. We ought to pass a law now to the effect that no man worth a hundred million dollars should ever be tried for any crime." Norris is quoted in Ferdinand Lundberg's 1937 classic, America's 60 Families (p. 189, Lundberg Press Reprint, 2007). Lundberg went on to say that "such legislation would serve to formalize de jure an existing condition, and would at least make consistency between theory and practice." Norris and Lundberg seem to have anticipated the Holder Memorandum. I might add that since most politicians seem to recognize no fiduciary duty to anyone but themselves, the status quo may be counted on to provide the requisite insulation from the law for the foreseeable future. By the way, the Australian Broadcasting Company has an interesting documentary on tax fraud that is well worth watching. (“Tax Me if You Can,” abc.net.au/4corners, 2008; also available as an Amazon Instant Video). For an interesting and objective look at tax havens and tax avoidance from the point of view of a Cornell Law student, see http://www.lawschool.cornell.edu/research/ilj/upload/szarmach.pdf .